If you trace the Ainu, the indigenous people's of Hokkaido's original pronunciation of 'Furano,' it is 'Furanui,' meaning 'Smelly Place.' 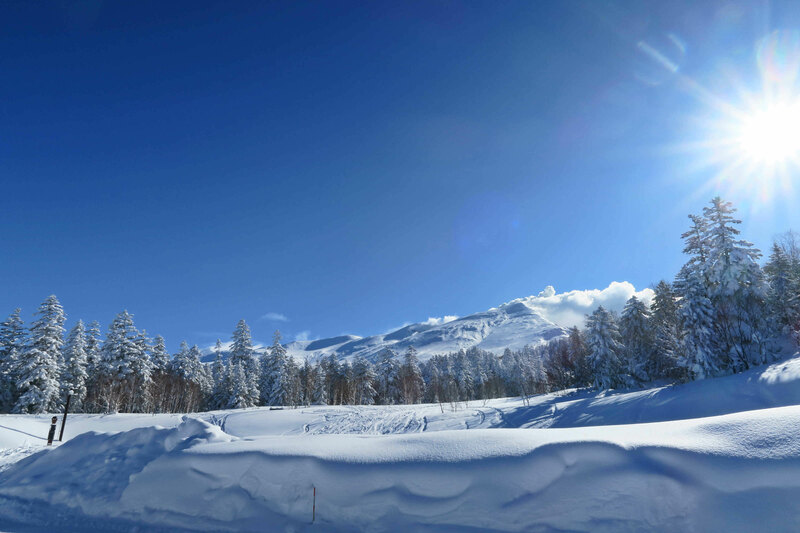 Furano township sits nestled in the valley at the base of the southern end of the Daisetsuzan National Park. Arriving here as a ski tourist, the only real smell that you might be aware of is the scent of local curry emitting from the restaurants, for which the town is also famous for. On some days though, when the wind is blowing in a north easterly direction, you may catch the faint smell of sulphur in the air. This would be from Mt Tokachi, which is a smoking volcano at the southern end of the park. During the deep winter months of January and February, the mountains of the national park are often not fully visible. 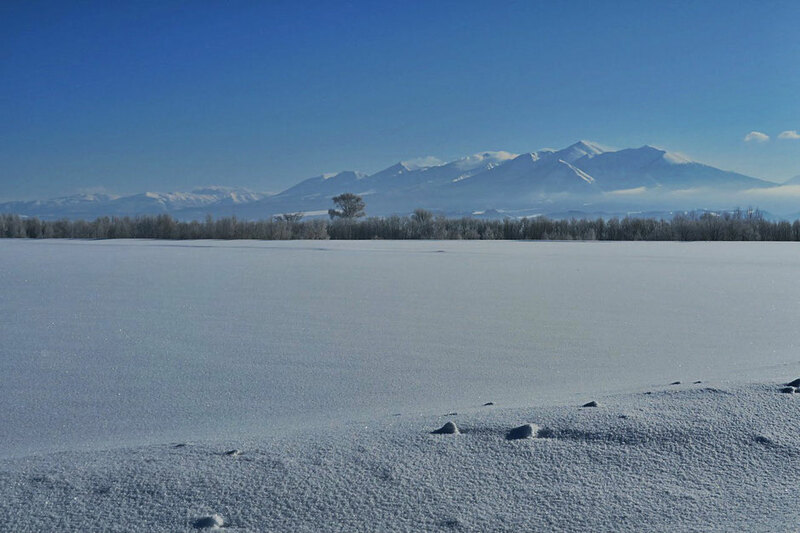 But on clear days, from Furano you are able to see the whole range extending north sixty kilometres, and the faint outline of smoke rising up from Mt Tokachi, the source of the sulphur. Passing through Kami-Furano which is the town below the volcano, one is reminded of its power. A giant boulder sits on the edge of town with a plaque, stating that it was projected twelve kilometres during the 1926 eruption. 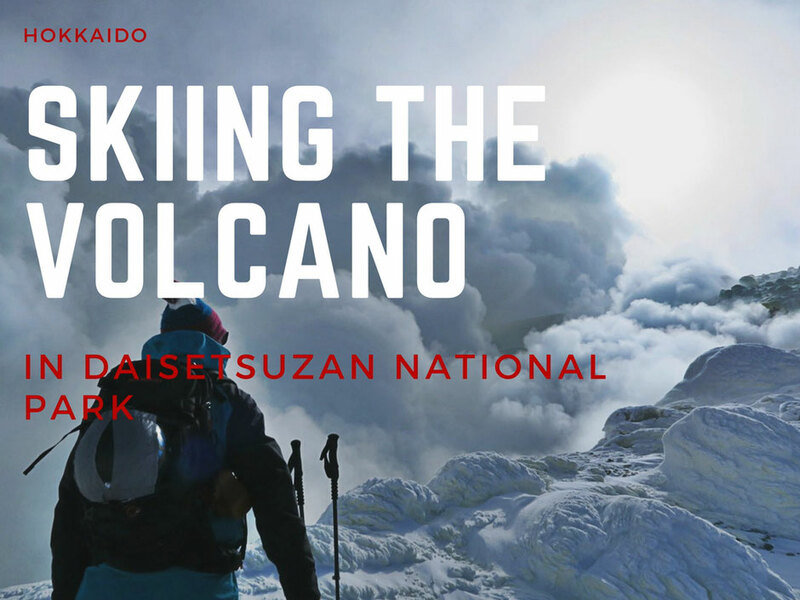 There are thirteen live volcanoes on the island of Hokkaido, of which Mt Tokachi is one of them. The last time it erupted was in 1989. Actually, there were a series of eruptions starting from 1983 to 89. Prior to that it was 1962. The big eruption occurred in 1926 which sent volcano smoke spewing out up to 10,000 meters in to the atmosphere and forced an evacuation of Kami-Furano. 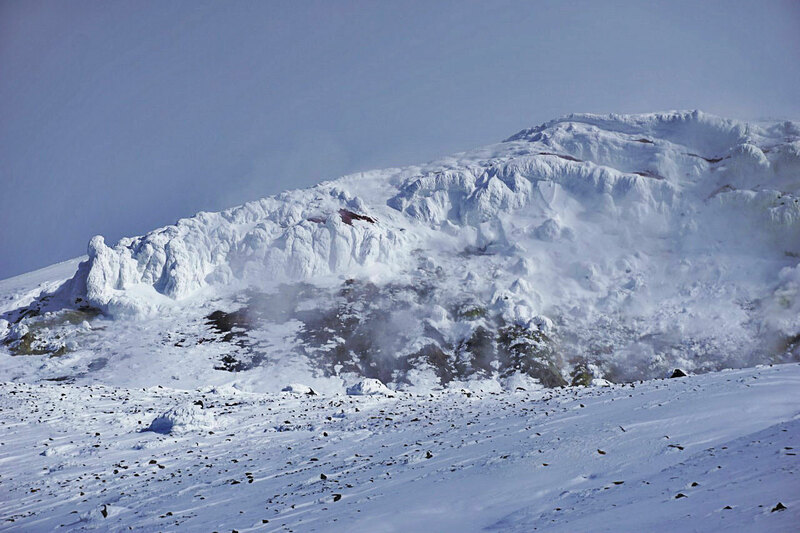 Tokachi volcano now sits on level 1 of a 5 level hazard scale, making it a safe ascent, and three web cameras around the sides of the mountain keep a close eye on its activity. 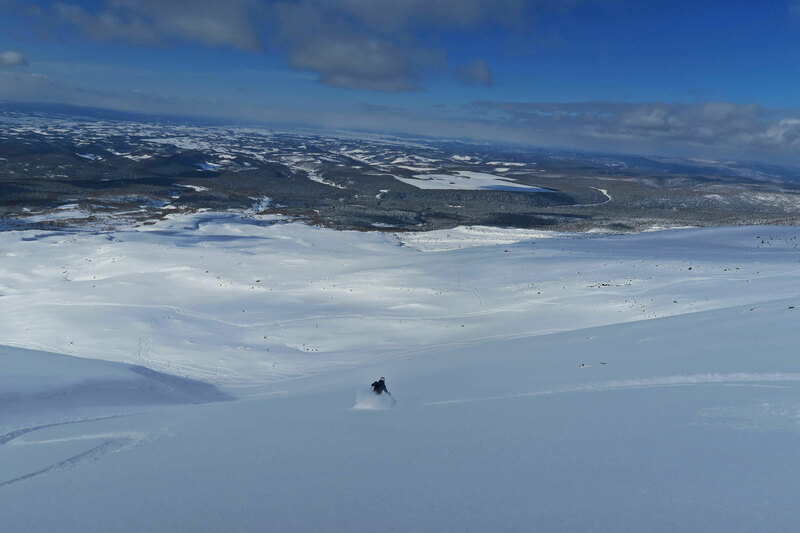 Season 2017/18 has been the biggest that we have seen, and days we have been able to ski the volcano have been few. From 1,000 meters elevation, unlike some of the other mountains in the area, it is almost immediately alpine due to its history of eruptions leaving the landscape bare of trees. To ski the volcano, clear days are needed, and also winds where the noxious fumes are blowing in the opposite direction, for obvious reasons. We had Chloe and Sam for four days of guiding. They had met skiing and decided to spend some of their honeymoon doing what they are both passionate about. 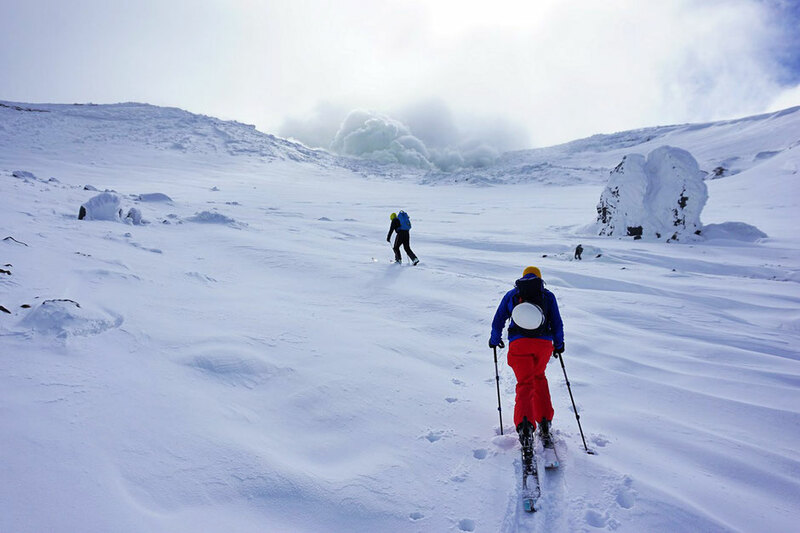 On the second day of their trip with us, the skies parted to give us an opportunity to ski the volcano. Ski days are memorable for various reasons. 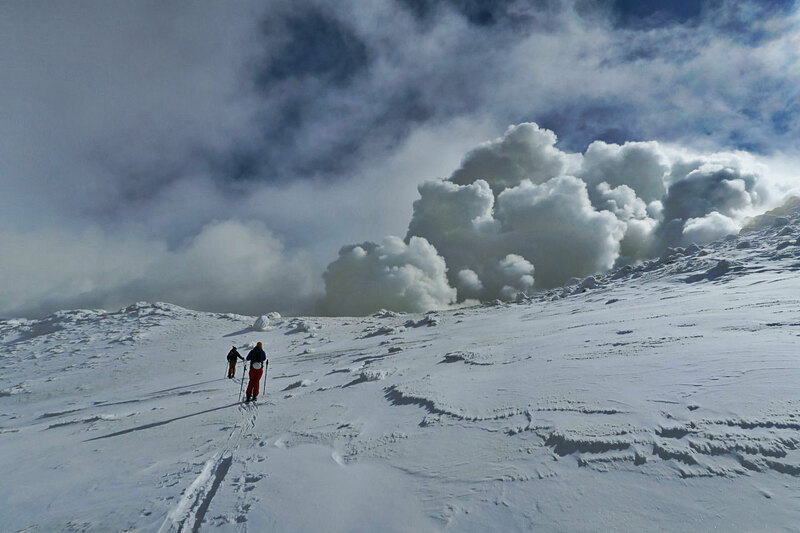 To ski a live volcano on your honeymoon would have to qualify. The approach takes you around the North west flanks of the mountain before ascending the 800 meters vertical to the top of the volcano. Technically, this is called 'Mae Tokachi' or 'Front Tokachi.' It is part of a bigger mountain called 'Tokachidake which is the highest mountain at the southern end of the park. Being on a live volcano is a barrage on the senses. The smell can be pungent, depending on the direction of the smoke, and the closer you get there is the dull taste of sulphur on the palate. Some days the best skiing on the volcano is the gully sections that provide the best protection from the wind. 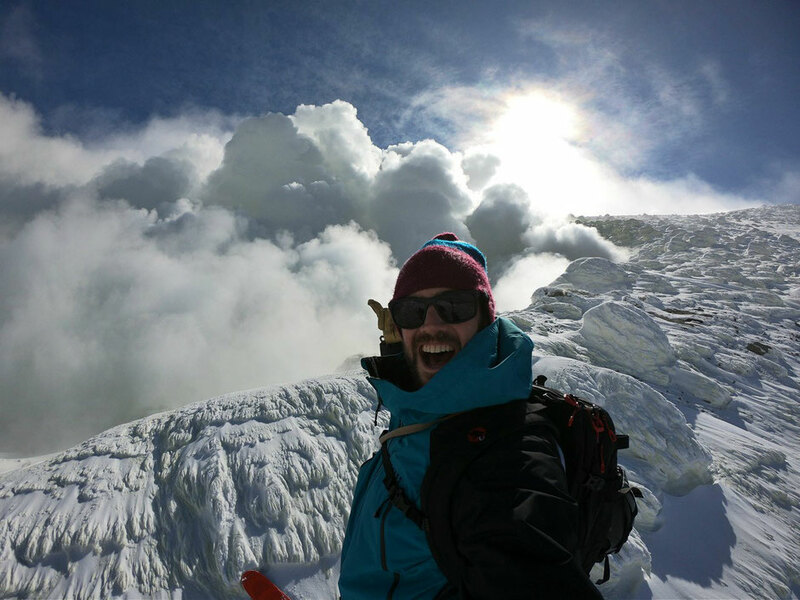 The wind blows the snow in to the gullies where it is protected and maintains its powder form. 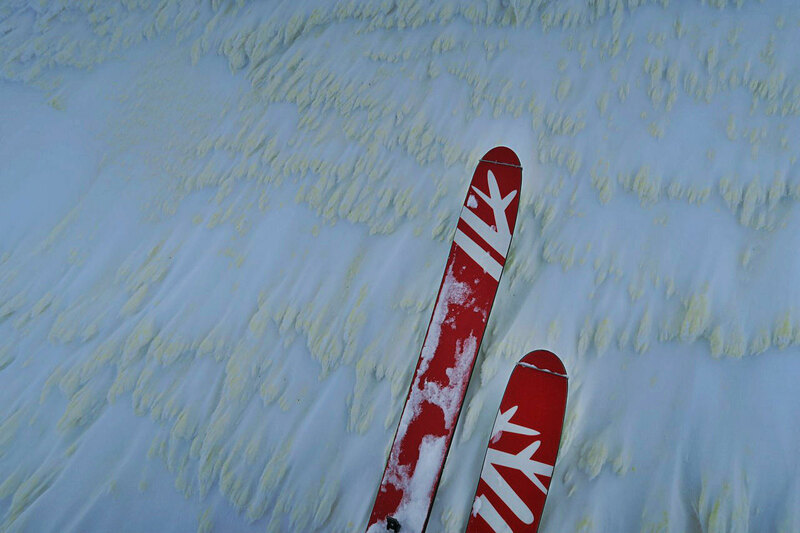 How good the skiing is really depends on how much wind there has been during and since the last snowfall. Windless conditions and vertical falling snow are the ideal. 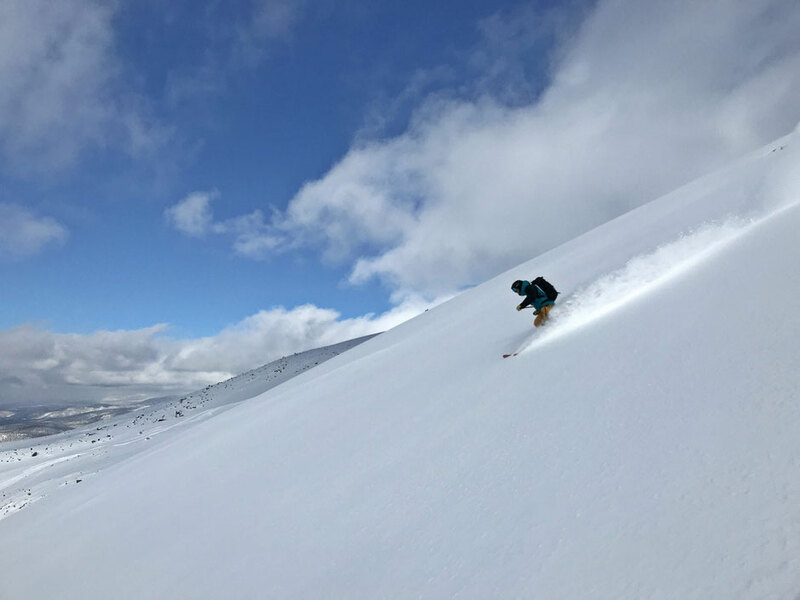 We were lucky to have 10cm of new snow the night before with little wind, so skiing from the top was good and just got better the further we descended. So much so that we felt that the conditions warranted a second run on a different section of the volcano. 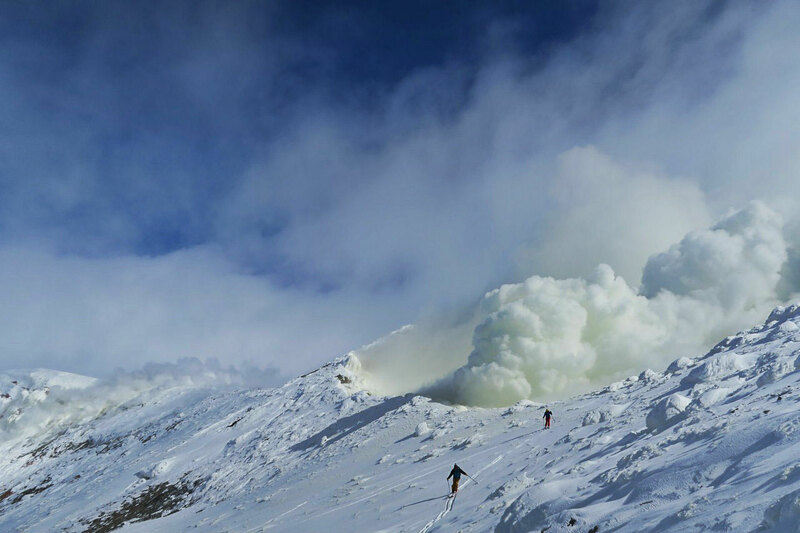 Apre ski in Japan is soaking in a thermal spring. In the Tokachi area, one has the opportunity to sit in a spring and have views of the area that you skied. It is here we finish and try to discern our own ski lines, while reminiscing on a most memorable day.